Since 2011, the Grant Program has funded more than 45 projects. Work on grants awarded during Rounds 1-4 of the current 6-year funding cycle has largely been completed. During Round 5, the grant program funded the Puget Sound Institute (PSI) to analyze and synthesize results of the first 4 years of awards. As part of an adaptive management strategy, the aim of this grant is to evaluate past results in order to inform and optimize outcomes at project, programmatic, and Puget Sound recovery levels. PSI is evaluating the Grant Program’s portfolio of projects in groups by investment area. This report synthesizes the findings presented in the 14 grant products listed in Table 1 of this document. Our analysis is not a comprehensive review of regulatory effectiveness and stewardship issues in the Puget Sound region. We focus on the lessons learned and implications of these specific projects. Analysis of project results is organized by the sub-strategies used in the Action Agenda to facilitate consideration of recommendations contained herein during 2016/2017 updates. Kinney, A., Francis, T., & Rice, J. (2016). 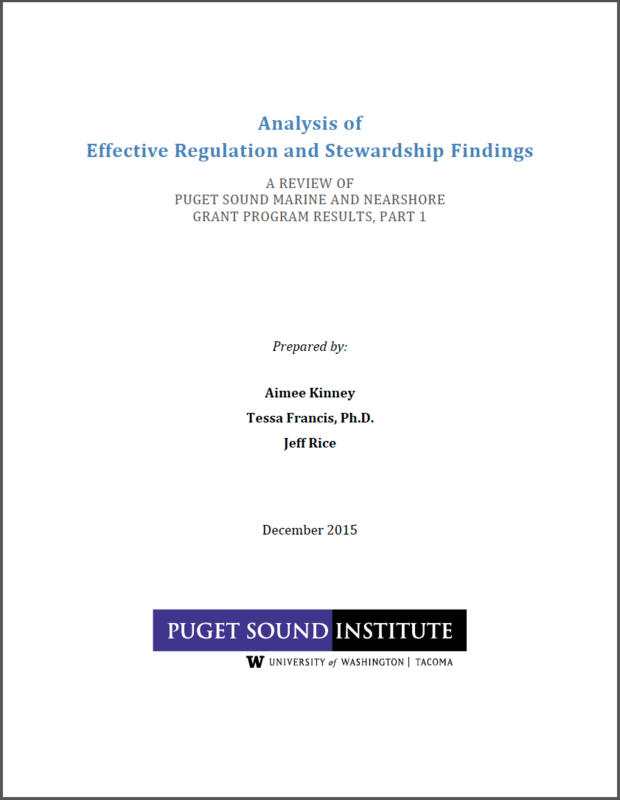 Analysis of effective regulation and stewardship findings: A review of Puget Sound Marine and Nearshore Grant Program results, part 1. Tacoma, WA: University of Washington Puget Sound Institute.